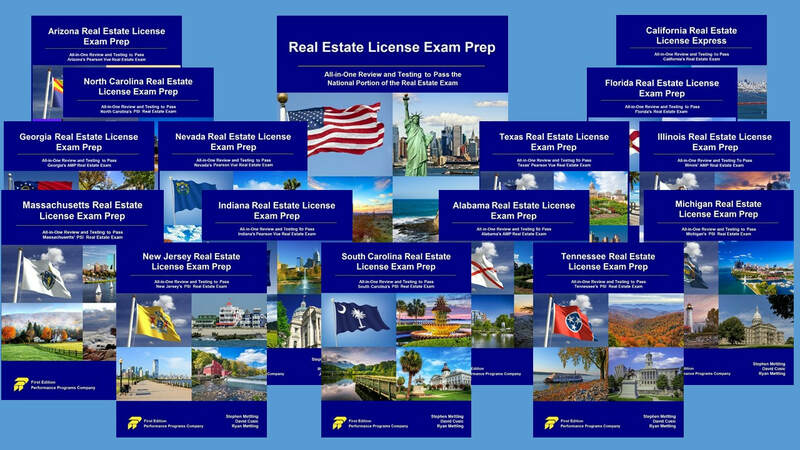 The Real Estate License Exam Prep (RELEP) series is currently available in PDF, Word, Mobi, and epub formats as well as in traditional print. State-specific RELEPs are available for Alabama, Arizona, Arkansas, California, Florida, Georgia, Illinois, Indiana, Massachusetts, Michigan, Nevada, New Jersey, North Carolina, South Carolina, Tennessee, and Texas. For others states we have National RELEP. Ordering- To place a printed book order either email Ryan Mettling at ryan@performanceprogramscompany.com or call us at 813-512-6269. We process the order and send you an invoice. The books then arrive in 7-10 days and payment is due within 10 days of book arrival. Licensing- To license electronic versions of RELEP under a license agreement, please call us at 813-512-6269 for more information. We license e-versions (PDF, Word, ePub, and Mobi) of our exam prep titles to schools. To license with us, you simply have to fill out and return our licensing agreement. With licensing, there are no up front fees and you do not pay us until the student pays you. What we require on your end for licensing is a learning management system (LMS) for security purposes.